Some research considers corruption a ‘grease the wheels’ instrument. In this view, corruption helps to overcome cumbersome bureaucratic constraints, inefficient provision of public services, and rigid laws (Huntington 1968, Lui 1985, Lein 1986), especially when countries’ institutions are weak and function poorly (Acemoglu and Verdier 2000, Meon and Weill 2010). Other papers argue that corruption only reduces economic performance. This is due to rent seeking, an increase of transaction costs and uncertainty, inefficient investments, and misallocation of production factors (Murphy et al. 1991, Shleifer and Vishny 1993, Rose-Ackerman 1997) that come with corruption. A third stream finds ambiguous effects of corruption can be illustrated with respect to public finances in new EU member states. Hanousek and Kocenda (2011) show that reductions in corruption either increase or decrease public investment, depending on the country and its institutions. On the other hand, improvements in the corruption environment are mostly associated with better fiscal performance (decreases in the deficit as well as debt). In a recent paper (Hanousek and Kochanova 2015), we attempt to provide an explanation of the divergent effects found in the previous literature. We examine whether bureaucratic corruption, measured as the frequency of unofficial payments to public officials to ‘get things done’, impacts the sales and labour productivity growth of firms in Central and Eastern European countries. To identify this relationship is not an easy task, since bribery and firm performance can influence each other through other unobservable factors. In addition, it is difficult to have good quality data on both corruption and firm financials. Therefore, we use firm economic performance data from the Amadeus database, and enrich them with the information on bribery practices from BEEPS. To combine the two datasets, we consider ‘local markets’ as clusters formed by country, double-digit industry, firm size, and location size. Within those markets we compute the mean and dispersion of individual firm bribes, and assign them to every firm from Amadeus belonging to the same cluster. Given that we cannot observe firm-specific bribery practices, these two measures are the best way to characterise local bribery environments. The mean of firm bribery proxies the equilibrium level of bureaucratic corruption. The dispersion of bribery represents the distribution of firms’ bribing behaviour formed by their willingness to pay bribes, the variety of bribing strategies, the discretionary power of public officials to extract bribes, and uncertainty regarding environments. We find that the ambiguous consequences of corruption found in previous studies could be explained by divergent effects of the mean and dispersion of corruption. In particular, a higher bribery mean retards both the real sales and the labour productivity growth of firms. This is generally consistent with the existing firm- and macro-level empirical research. 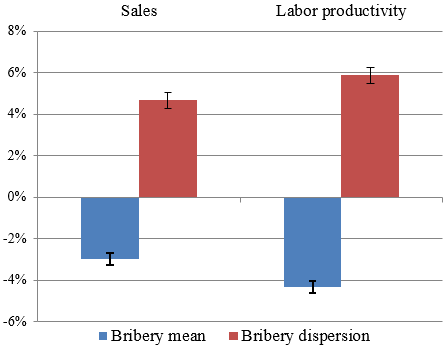 In contrast, a higher bribery dispersion of individual firm bribes facilitates firm performance (see Figure 1). This implies that in more dispersed local bribery environments at least the majority of bribing firms receives preferential treatment from public officials, which allows them to grow fast. Their non-bribing (or less frequently bribing) competitors are likely more efficient in production and growth and are better at complying with bureaucratic regulations, as otherwise they would be displaced from the market. In less dispersed bribery environments all firms bribe in a similar way. Bribery acts as an additional fee, or an increase in operational costs that only impedes firm performance. Note: the average real sales growth is 4.6% and the average labour productivity growth is 3.1% in our data. We also find that the effects from bureaucratic corruption are larger in the case of labour productivity growth, suggesting that bribery affects the employment structure of firms. In highly corrupt environments, firms likely employ a non-optimal (higher) number of workers due to a misallocation of talent, in accordance with Murphy et al. (1991) and Dal Bo and Rossi (2007). Some employees may be engaged in unproductive activities such as searching for ways to circumvent bureaucratic constraints. It may also be the case that the corrupt local government does not allow firms to dismiss workers in order to keep high employment figures in the region and loyal voters. However, bribing firms that have an opportunity to gain a competitive edge (in more heterogeneous environments) are able to adjust the employment structure to an optimal level and increase effectiveness. Our empirical analysis demonstrates a two-way effect of bureaucratic corruption on firm performance. The existence of a certain number of firms that bribe increases aggregate firm performance, which is in line with the theoretical inference of Acemoglu and Verdier (2000). The chance to receive benefits from bribery may be one reason why corruption does not vanish in spite of its overall growth-restraining effect (Mauro 1995). One possible task for policymakers could be to improve the transparency of interactions between firms and public officials. That could reduce the discretionary power of both firms and officials, lower the preferential gains from corruption, and decrease both the mean and dispersion of bribery. This article is published in collaboration with Vox EU. Publication does not imply endorsement of views by the World Economic Forum. Author: Jan Hanousek is a Full Professor at CERGE-EI; Research Fellow at the William Davidson Institute, Michigan Business School; Research Fellow, CEPR. Anna Kochanova is a Senior Research Fellow, Max Planck Institute for Research on Collective Goods.